Next week we are slated to get some amazing news and reveals from the upcoming game Star Wars Battlefront II. EA has announced that they will be doing a special presentation at Gamescom this year and much will be revealed about Battlefront II. This upcoming Monday at Gamesom, EA will debut a brand new trailer for Star Wars Battlefront II, along with much anticipated gameplay footage of space combat in the game. 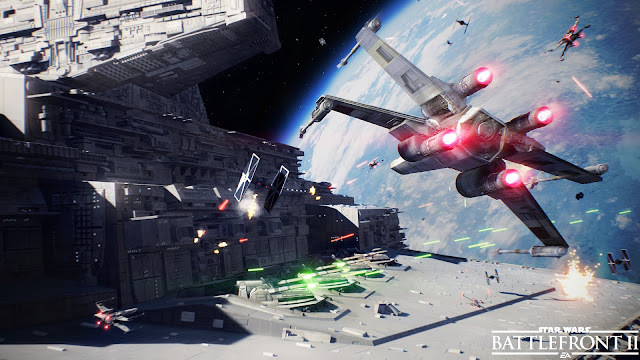 Similarly to the "Assault On Theed" live stream during EA Play, the event will be broadcast live at 9:30am PT on Monday, August 21st and will pit two teams against each other over Fondor on a map that features a shipyard and an Imperial Star Destroyer. They also confirmed that well know YouTube creators such as Jakfrags and Westie will be among the players participating in the match. Be sure to catch the live stream on EA.com on Monday! You'll also want to get ready for the Beta, which begins on October 6th. The full game will be available on PS4, Xbox One and PC on November 17th!